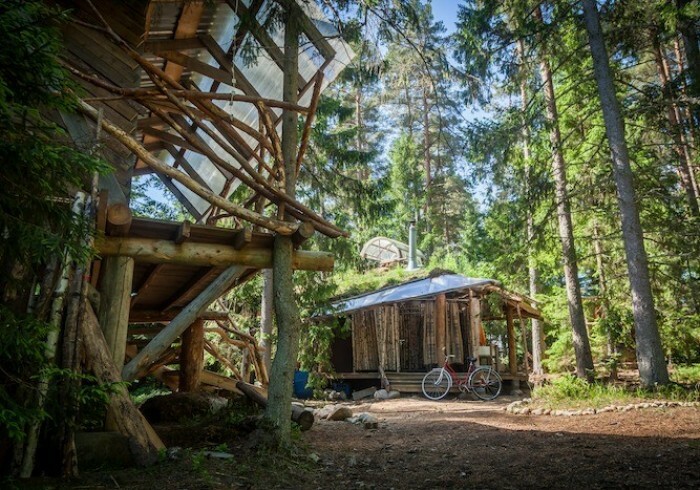 By placing a booking with us (Projekt-Kodu Retreat and Eco-Hostel), you (the lead guest) and your booking party (guests) agree to the following terms and conditions as set-out. During your stay you agree to abide by the subsequent conditions as set-out. If you have any questions about booking with us, please contact us before making a booking. To place a booking with us the lead guest must be at least 16 years of age. The maximum number of staying guests per room is illustrated in the room occupancy details on the website. Where the person making the booking is different to the lead guest taking up the occupation, the person making the booking may be held responsible for cancellation, non-arrival and damages as set-out within. Only the lead guest and the named booking party are allowed to use the property and its facilities, any third party visitors are only allowed access at our express permission.To secure any booking we require full amount of booking to be paid in advance. Any meals or services are included only if specified. Full amount of booking must be 'cleared funds' before a booking can be confirmed. Deposits are only refundable under the conditions set-out here within. Payments can be made online, over the phone using a debit/credit card as well as by digital bank transfer or cash deposit. Any charges raised against us by our banks for handling dishonored bank transfers or any other payments, must be reimbursed by the lead guest within seven (7) days of any request to do so. All guests agree to respect the privacy and peace of all other staying guests, neighbors and the owners at all times. We reserve the right to cancel a booking with immediate effect if guests are not honoring this agreement or are causing a disturbance/nuisance to other guests, neighbors or the owners. During your stay we will calculate the incidentals charged to your room on a daily basis. All outstanding charges must be paid for in full on check-out; we accept cash payments at no extra fee or debit/credit card payment at a 3% fee. Non-arrival guests, who are unable to attend or fail to attend for whatever reason forfeit their deposit paid and the full amount of the booking will be due. It is suggested that booking guests take out appropriate holiday / cancellation insurance where required. In the rare event we need to cancel your booking with us, please be aware that we cannot be held liable for circumstances beyond our control and that our liability to you is limited to the refund of any payment already made. Your booking is for a class of room and does not guarantee that you will be able to stay in a specific room. We recommend insurance to cover cancellation, loss, damage or injury. As a small business we are not able to act as your insurers and rearrange your stay due to your changes in personal circumstances. We operate a small scale, relaxed and laid back accommodation. We welcome musicians and music but we ask for you to be respectful of surrounding guests and neighbors. We ask guests to keep to a low noise policy between midnight and 8am. WiFi Internet access is provided only in the main site area. Please note it is not provided in tents. Where WiFi Internet access is provided, guests accept to use this access to the Internet fairly and appropriately. We may monitor network performance and user usage in order to maintain a fair and high level of service to all our guests. The Internet access provided is intended for general use such as access to the world wide web, email, messaging, social media, light video / music / media streaming. It is not intended or ideally suited for heavy media streaming, online gaming, extensive downloads / uploads. Access to illegal activity or use of our network for illegal activity is not prohibited and will be reported to local authorities. We reserve the right to charge the lead guest for any damages caused through the course of a booking by any member of the booking party. This includes breakages, spillages, stains, damage to furniture or fixtures and fittings. Any accidental damages should be reported as soon as possible in order to minimize damage and associated costs. Lost keys to bike locks will incur a replacement charge per key. Any lost property, if discovered and found, left behind by guests during a stay will be held for a period of 1 month. While we will make our best efforts to reunite lost property with their owners we accept no responsibility in replacing lost items and encourage guests to ensure they have all their belonging before checking-out. We may offer to post lost items via recorded delivery at the cost of the property owner, otherwise collection can be arranged. Smoking of any tobacco products is not allowed in tents and is only allowed in designated areas as sign posted throughout the accommodation. Pets are welcome on-site with written notice. At the time of booking, you accept responsibility for any damage caused through the course of a booking by the pet related to the booking party. On-site parking is provided to paying guests. Please note our site is located on an lightly maintained dirt road and the car park is in an unprotected area in an open field. Guests accept personal responsibility for their vehicle and accept that they park their vehicles at their own risk. Our site is remote and off-grid, meaning it is not connected to the mains electricity. Tents and facilities are located down single dirt tracks in the forest and we only have stair access to toilets, facilities and kitchen. Please contact us at +372-5699-7449 or info@projekt-kodu.ee to discuss specific individual requirements and the availability of appropriate accommodation, and we will do our best to accommodate your needs. Relax and recharge with us at our off-grid, rustic retreat in Lahemaa National Park. Sleep amongst the pine trees in one of our luxury bell-tents. Enjoy complimentary yoga classes, full-use of rustic spa facilities and free-to-use bicycles for exploring Lahemaa's forest.